Her first official appearance since announcing the pregnancy and the illness at the same time. 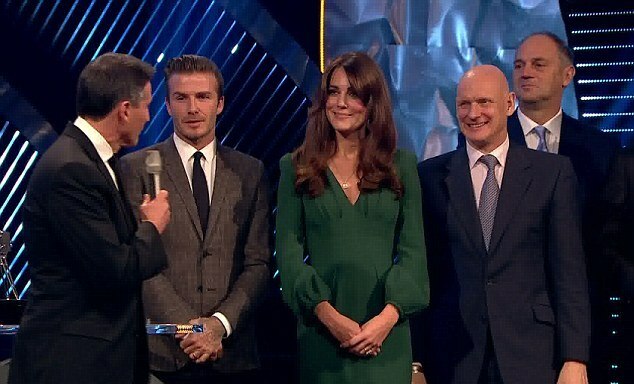 Princess Catherine attended the BBC Sports Personality of the Year Awards last night in London and presented two awards, staying around 45 minutes. But still, a very good sign as she’d cancelled four previous engagements including The Hobbit premiere last week where Prince William showed up alone. Will is said to have gone back to work in Wales, also seen as a good sign by royal watchers as he would not have left her if she wasn’t in much better shape. As you can see, Baby Wales isn’t making much of a statement just yet -- Katy Cambridge looks totally the same now in her green Alexander McQueen than she did several months ago but for the new layers in her hair and the gauntness in her face. We probably have at least another month to go before we’re clear. And she’s apparently still deciding how to spend it. There’s word that she may opt out of the annual Royal Christmas at Sandringham and stay with her parents instead. PS Photo Assumption Zara Phillips’s face. Does she seem over it to you? 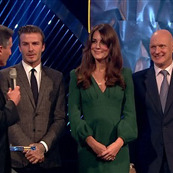 Click here to see more photos of Kate last night.